The weather is still miserably cold, and there is nothing but work for months ahead until the spring. Better people than us have seriously considered sleeping until summer in these conditions, but then instead decided to go for a weekend break somewhere else. Who are we to argue with what better people than us have done? Let’s join them, and hit one of Europe’s most misunderstood capitals for a few days. 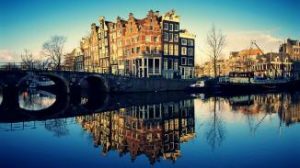 Amsterdam is always a popular holiday destination, and its bustling life does not suffer one bit from the cold winter months. On the contrary, that’s when the city can finally be itself. One of the advantages of visiting Holland in the dead of winter is that the weather is about the same you’d encounter in autumn, or in the spring. There is no sudden worsening of temperature, here: things start cold and windy on the first of September, and stay that way through the end of April. Occasionally it stops raining so the water on the streets can freeze properly, but little else changes in that period. During winter, mobile bakeries deploy through the city to sell passers-by warm oliebollen. With or without raisins, plain or showered in an indulgent layer of powdered sugar, these deep-fried relatives of donuts are a special treat on cold mornings. Sugar and warmth, on the go as you browse windows and shops for deals. If sweet is not your thing, and you’re feeling a little adventurous, you can walk off the main shopping streets, head to Rembrandtplein and search the busier intersections for the entrepreneurial souls who set up little chestnut roasting stations to ward off the chill of winter. A wrap filled with hot chestnuts may not contain sugar or raisins, but makes up for it in volcanic heat and is equally flavorful. Street life in Amsterdam continues completely unabated when it gets cold, and you’ll find a healthy flow of locals and tourists filling the streets. The flower market is the only part of the city that suffers at this time, and looks a lot like a plastic ghost town. You’ll have to cross it to walk back from Rembrandtplein to Leidseplein by way of the major canals though, and if you feel like you shouldn’t be out of in the cold at any point through your ordeal, there are plenty of excellent little cafes on the way. There is an astounding variety of watering holes in Amsterdam, but my very favorite are the traditional wood-paneled eetcafes that serve a wide selection of cold, warm, alcoholic or boring drinks, along with a selection of typical Dutch snacks that range from toasties to Holland’s national treasure: deep-fried meat ragout croquetten. How long is a girl supposed to sustain herself on chestnuts and sugar anyways? Enjoy the murmur of conversation around you, sit back and watch those silly people walking through the cold (and possibly snowed-over ice) while you enjoy a stiff drink and a plate of steaming, crunchy-on-the-outside-and-molten-inside bitterballen or croquettes. It’s the small pleasures in life that give us the strength to face the hardships, such as getting all the way to the next major square. 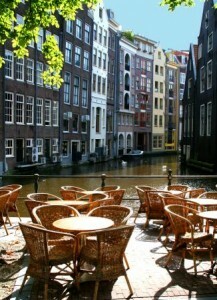 Leidseplein is an ideal springboard for visiting many of Amsterdam’s hotspots. Sure, the famous Bulldog coffeeshop is here, alongside with the Hard Rock Café and many of Amsterdam’s most exclusive hotels. You could go lose yourself in the bustle of this square that never sleeps, though it occasionally falls into a drunken stupor. Just as a girl does not sustain herself on sugar, however, there is more to life than beer and fun. I know that sentence won’t make sense to many, and I’m not sure I understand it myself entirely, but I’ve been told it’s the path to wisdom. Most of Amsterdam’s most spectacular museums are only a short distance from Leidseplein, and they offer both refuge from the cold, and the kind of quiet, subdued atmosphere that somehow belongs to the winter season.You could, of course, mix the best in life and visit the Heineken museum as well. Culture doesn’t have to be boring. Night falls early this time of the year, and be ready for full a deep black sky any time after 5pm, once you emerge from your museum visit. Street lights maintain a yellow glow that make Amsterdam by night look like a neon version of Rembrandt’s Night Watch, which you hopefully were just checking out, instead of just ogling at beer barrels all day. Amsterdammers have a long and complicated hate-hate relationship with the early nights of Northern winter. 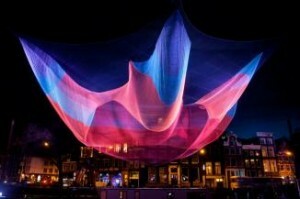 There is no escaping the gloom that such protracted darkness can bring, and one of the solutions they found to fight back is the Amsterdam Light Festival. For five weeks from December to January, the city exhibits light sculptures and projectors pointed at the historical buildings. The supernova of color is dazzling against the dark sky and dimly light streets, surreal because the evening barely started in more fortunate countries, and unmissable by anyone with a brain. Through the center’s streets, Amsterdam’s response to early nights is to state with typical Northern resolve that we may well be freezing our most precious body parts off, but can also make a splendid statement at the same time. If you happen to be visiting during a freeze year, the canals will be iced over, and thick enough in many parts that local residents fearlessly skate on them, dancing around the ice-locked boats and barge. Stop for a moment to drink it all in, before heading over for your night of revelry; skaters on the canals by the lights of the Festival, the flow of people and warmth spilling out into the street from busy shops and restaurants. Summer may be a while yet, but that’s not necessarily a bad thing. So happy to see that. I’m planning a trip at the end of March.